On leaving the railway station turn left and walk to the traffic lights. Cross over and walk up the High Street, which is pedestrianised. Walk passed Boots, Marks and Spencer, Primark and then under a stone arch across the precinct. Cross over the road and walk passed Binns up towards the pelican crossing. Cross over the road and keep walking until you pass Pizza Express and reach a pub called Kind. Turn left into St Martins Lane which opens out into a Square with a Public Garden. The first doorway on the left with the white doors is to soundLINCS. Follow the signposts for Lincoln. At roundabout take the 2nd exit onto the A57 signposted Lincoln Central. Continue forward then merge onto the A57. 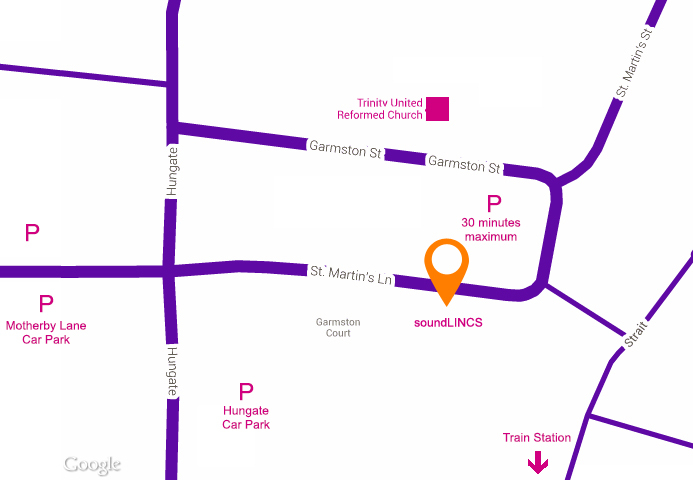 At traffic signals turn right onto Newland (A57) signposted City Centre, Sleaford A15. After pedestrian crossing, turn left onto Orchard Street. At top of Orchard Street, turn right onto West Parade. Where the road forks, take left hand lane to go straight over the junction onto Motherby Lane. At the top of Motherby Lane, turn right onto Hungate and first left is the NCP car park. On foot, leave the car park and walk towards the top of the road (The Cheese Society is at the top of the road). Turn right onto St Martin’s Lane and walk towards the High Street, past the Public Garden. The white archway and white doors on the right is soundLINCS. Travel along the A46 and at the Hykeham Roundabout take the 2nd exit to continue travelling on the A46. At the Doddington Roundabout take the 2nd exit to continue travelling on the A46 (Please note there are road works here). At the Skellingthorpe roundabout take the 2nd exit for the A46. At the roundabout take the 3rd exit onto the A57 signposted Lincoln Central. Continue forward then merge onto the A57. At traffic signals turn right onto Newland (A57) signposted City Centre, Sleaford A15. After pedestrian crossing, turn left onto Orchard Street. At top of Orchard Street, turn right onto West Parade. Where the road forks, take left hand lane to go straight over the junction onto Motherby Lane. At the top of Motherby Lane, turn right onto Hungate and first left is the NCP car park. On foot, leave the car park and walk towards the top of the road (The Cheese Society is at the top of the road). Turn right onto St Martin’s Lane and walk towards the High Street, past the Public Garden. The white archway and white doors on the right is soundLINCS. Travel along the A17 and at the Holdingham roundabout take the 4th exit onto Lincoln Road (A15) heading to Lincoln. Continue along the A15 to Bracebridge Heath. At the traffic lights at the junction with Canwick Avenue (B1131) turn right onto Canwick Avenue. Follow the B1131 and turn left onto the B1188 onto Canwick Hill. Continue onto Canwick Road (A15). Turn left at Clasketgate (B1308). Continue onto West Parade and turn right at junction with Beaumont Fee. Take an immediate right onto Motherby Lane, where there is a car park on the left hand side. For alternative parking, at the top of Motherby Lane, turn right onto Hungate and there is an NCP car park on the left hand side. On foot, leave the car park and walk towards the top of the road (The Cheese Society is at the top of the road). Turn right onto St Martin’s Lane and walk towards the High Street, past the Public Garden. 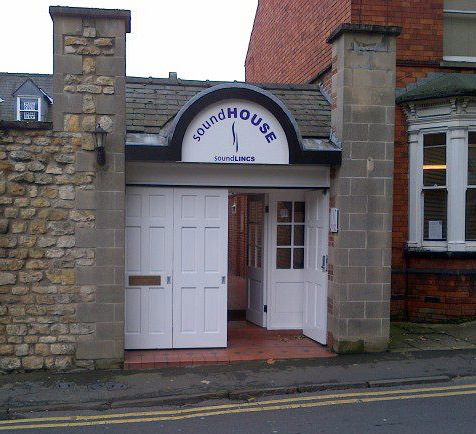 The white archway and white doors on the right is soundLINCS.